When buying an ActiveFloor, you will make a one-time payment and get ownership of the equipment. After this, you may choose to purchase a subscription to a technical support and software package, lasting 36, 24 or 12 months – it will always be possible for you to extend the period. A support and software package will ensure that your ActiveFloor is going to work at optimal performance, and that you have free technical support 24/7. ONE, PRO, PRO+ or MAX? We have four solutions: ONE, PRO, PRO+ and MAX. The size of your floor depends on how high your ceiling is and which of the solutions you choose. ActiveFloor ONE is the ideal solution for nursery schools and day nurseries. Compared to PRO and MAX, the ONE solution has a smaller floor in terms of physical size, which is not of great importance to small children. ActiveFloor PRO has a bigger floor than Active Floor ONE, and is, therefore, the ideal solution for schools, libraries and for various before- and after-school care facilities. ActiveFloor PRO+ is basically the same as PRO, but PRO+ has an extra wide optic. Therefore, the solution is ideal for schools, libraries and for various before- and after-school care facilities with low ceiling height. ActiveFloor MAX has the same floor size as ActiveFloor PRO, but has a higher light intensity and is, therefore, the ideal solution for bright rooms, where there is not any possibility of blocking out light. When buying your interactive floor, everything you need to make it work is included: projector kit, vinyl floor, computer, speakers etc. And, naturally, we are going to take care of the whole process of assembly for you. When you buy our interactive floor, free technical support and service are included. We are only one call away, and we are ready to step in if any problems should arise. The software is connected to a unique licence so that your installation and games can be accessed by your users only. The licence contains all the game templates – and you can implement your own content to them all on your own. You are going to be connected to a library of games where we, on a continuous basis and in cooperation with teachers and pedagogues, are going to release new content aimed at various age groups, learning targets and themes. In this way, you can always find games that are ready for use. In our online community, you have the possibility of sharing knowledge, “asking silly questions”, getting tips on how to use your Active Floor in new ways, and you will, continuously, receive information on software updates. The software is continuously updated with improvements and new game templates. Without any extra costs, you will have access to all of the updates, new games and improvements. Let us put together a a non-binding offer that you can bring to the head of your school or others who might be a part of the decision-making process. Are you unsure which solution is going to fit your nursery school, school or after-school childcare facility? Let go of your worries – together we will find the right solution for you, so that you won’t have to wonder if you picked the right one. “We are very happy with ActiveFloor. It is a good supplement to the other activities we do. LærkeManager in the Milky Way, a childcare facility. “ActiveFloor is a brilliant tool to use to support all our set targets and intentions. “It is a tool that all students can use, but it is especially a great support for students with certain needs. “You clearly see how your boy is very happy and get in touch with the others in here. CamillaA mother whose son is admitted at a danish hospital. Get going with Active Floor. 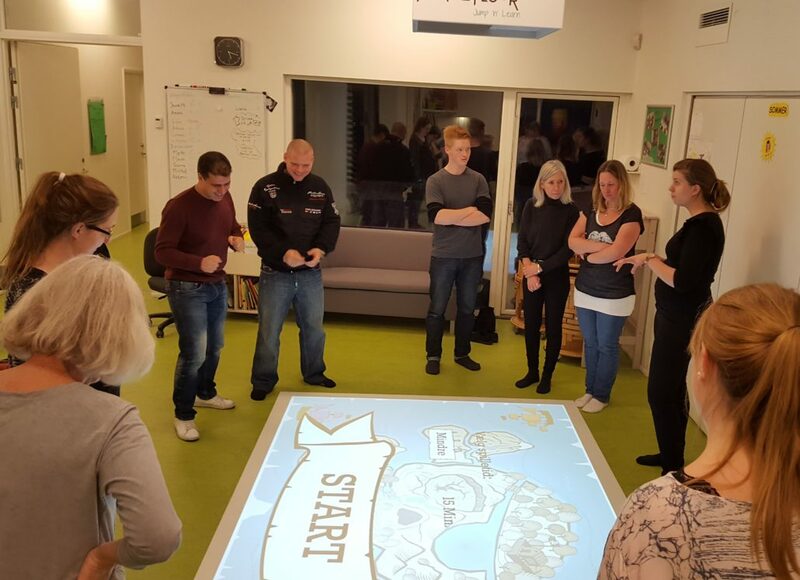 With Active Floor you can develop your own content and tailor the games in relation to degree of difficulty and subject – in other words; you are never going to run out of new options of combination. This is the reason why Active Floor is going to provide you and up to 14 of your colleagues with an intensive, in-depth three-hour course on the universe of Active Floor and its possibilities. We will go through all of the games and the various possibilities of each of them, and you will also be taught how to make your own games.